Villa Mezzogiorno is the perfect place for an unforgettable experience! 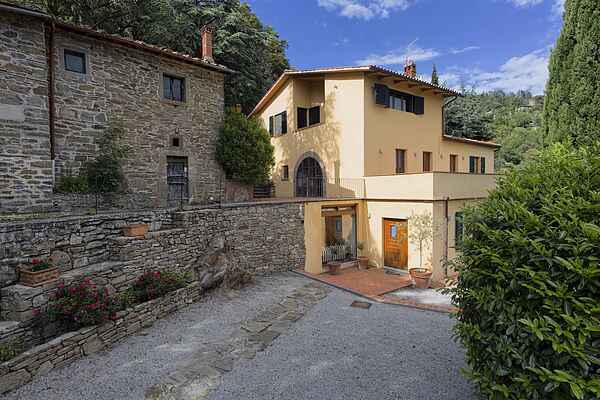 This magnificent property is situated in the heart of the hills of Cortona, in an extremely panoramic position that will offer your eyes all the spectacular splendor of the lush Tuscan countryside. The villa has spacious and beautiful outdoor spaces that will allow you to have time to relax in the shade of the big lime trees or sit on the terrace and then enjoy a tasty dinner of the the barbecue and stone oven, placed next to a beautiful stone table covered by a gazebo. The garden is spread in the length of the house taking you through the paths up to the panoramic infinity pool, ideal for long swims due to its size and complete with a sun deck. The villa also has a separate guest house, ideal if you are a large group. Inside the main villa ther is a sauna, jacuzzi, and gym equipment. There is air conditioning on the first floor. The villa's strategic position will allow you in no time to drive to the major tourist centers of Tuscany and Umbria, and at the same time will allow you to reach the historical center of Cortona in a few minutes.